Dinner on a Hurtigruten Cruise..
On our winter Hurtigruten Norwegian cruise, there were only about 45 passengers doing the whole round trip journey from Bergen to Kirkenes and back. Along the way a few passengers joined, but generally there’s plenty of room to spread out and mealtimes were very casual. This is not the case during the peak season where there may be several meal sittings and you have to make a table reservation for the voyage on embarkation. There’s plenty of food on our Hurtigruten Norwegian cruise and regardless of the low season and small number of passengers, they put on a great spread every day. 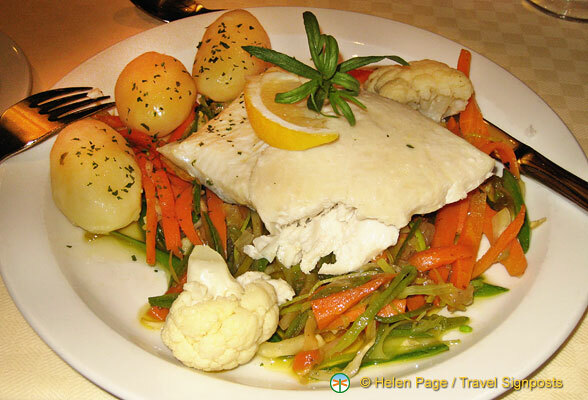 Norwegian food is served on our Hurtigruten cruise which is good for us as there is plenty of seafood. Meat eaters needn’t worry as there’s plenty of meats as well. 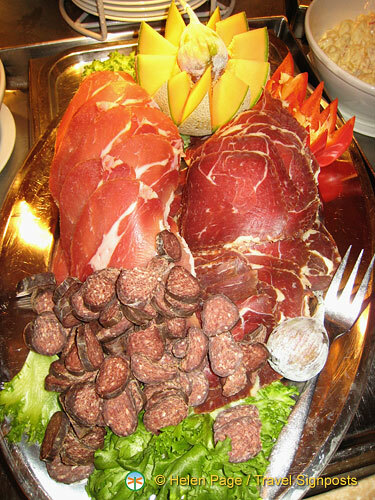 Breakfast is buffet style with a selection of cold meats, cheese, eggs, bacon as well as porridge, cereals, nuts, fruit and freshly baked bread. The yoghurt drink is very nice and I find myself having this and a small bowl of porridge just to pace myself. Meat Platter - Hurtigruten Cruise.. Lunch is a buffet with a selection of marinated herring dishes, smoked fish, poached salmon, cold meats and salads. If you like gravlax or cured tuna, you’ll be spoilt by the quantities served here. There are always some hot dishes which change from day to day, as well as desserts and fruit. Dinner is a three course set meal, where the main course is either meat or fish, generally served with potatoes and vegetables. Occasionally, dinner is a buffet as well. Alcohol is very expensive in Norway and on the cruise they offer a drinks package. As the cruises operate in Norwegian territorial waters, the prices on board are the same as on land. Very noticeable is the absence of alcohol at the dinner tables. You can also buy a water package which gives you any amount of fizzy water which they make on board.